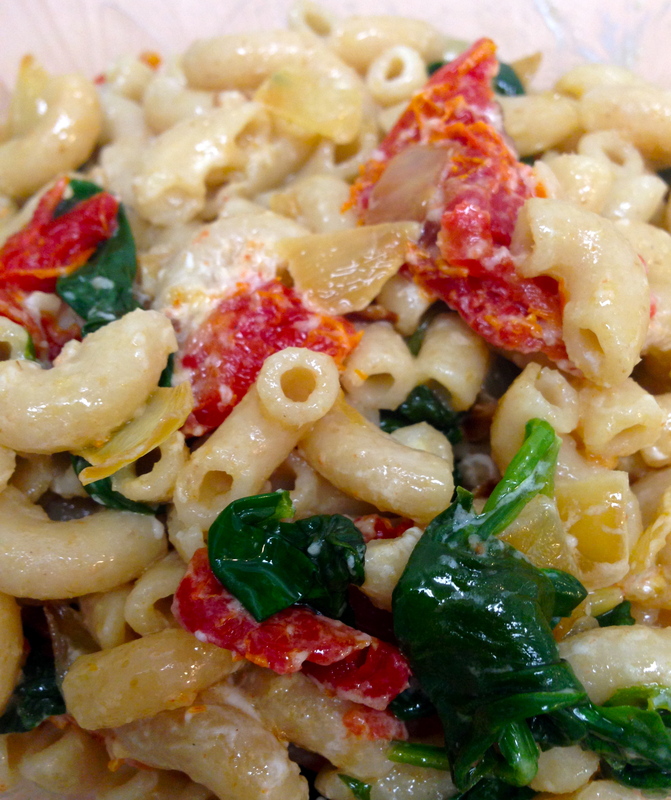 Can you tell I had some leftover sun-dried tomatoes and basil from my last dish? 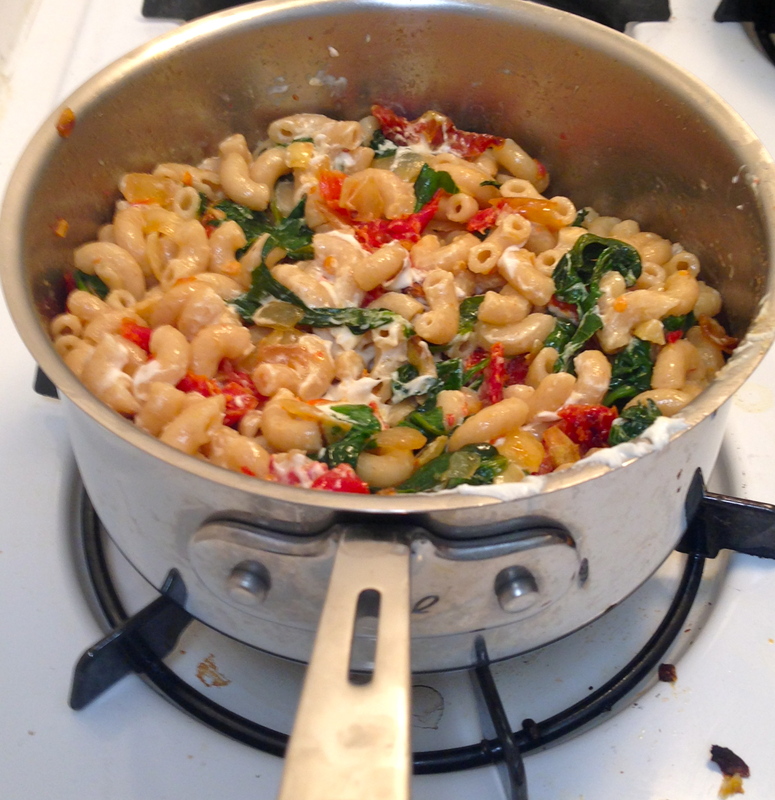 I decided to make use of the large quantities in which these foods are often sold and make my favorite pasta dish. This dish contains calcium, lycopene, vitamin C and fiber, and only takes about 20 minutes to whip up! Lycopene is a powerful antioxidant and is known to be abundant in tomatoes, giving them their deep, red color. Also, the fiber in this dish keeps you full and prevents severe blood sugar spikes normally seen with refined carbohydrates. 1. Bring medium-sized pot of water to a boil. Add pasta and cook according to directions on box. 2. Add 1 Tbsp olive oil to medium-sized pan and warm over medium heat. Add onions and cook for 10 minutes, stirring occasionally. 3. Add sun-dried tomatoes, spices and garlic to pan and cook another 5-7 minutes, stirring occasionally. 4. Strain the pasta and set aside, reserving about 1/3 C of pasta water. Add pasta water to pan and cook until all liquid has been absorbed (about another 5 minutes). This will make the pasta taste like it is in a thicker sauce! 5. Add remaining 2 Tbsp olive oil to pot used to cook pasta and replace on stove over low-medium heat. Add pasta and vegetables. Add chèvre and basil to pasta and combine all ingredients well. Serve and enjoy! 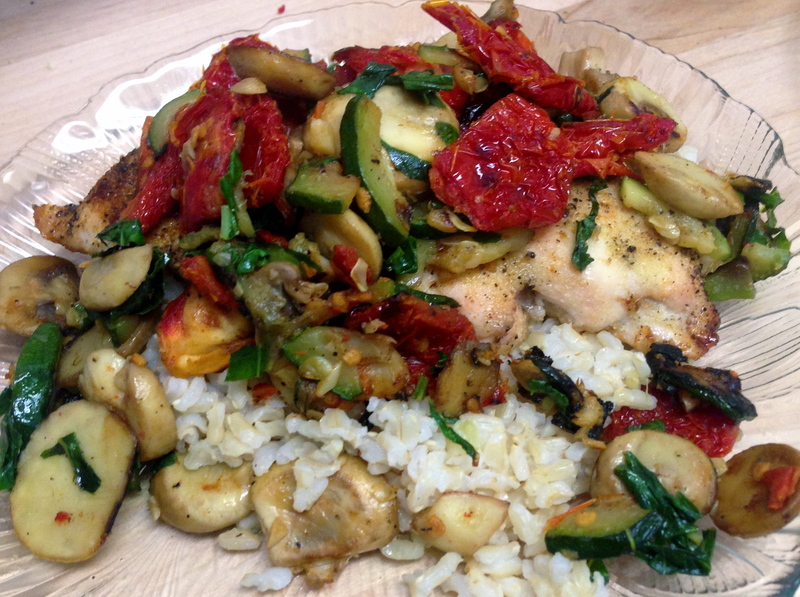 Vegetables are actually the shining star of this flavorful chicken dish! This dish boast almost 40 grams of protein per serving with only 12 grams of carbs, along with a plate full of lycopene and vitamin C. I like to prepare this dish on a Sunday night and have leftovers for the busy week – although it is also a beautiful presentation for company. I served mine over brown rice! 2. Chop zucchini. Cut sundered tomatoes so that the pieces are still fairly large. Chop garlic. Set aside. 3. Spray 9 x 13 inch casserole dish with nonstick vegetable oil cooking spray. Place chicken in casserole dish and drizzle 2 Tbsp olive oil over chicken. 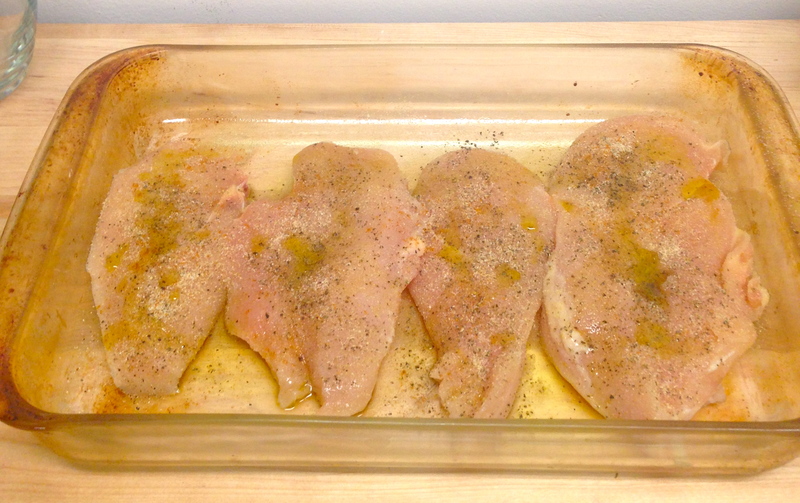 Top chicken with salt, garlic powder, onion powder and 1/2 tsp ground black pepper. Bake in oven for about 30 minutes, until chicken is cooked through (the chicken should reach an internal temperature of 165 degrees Fahrenheit. 4. Pour remaining 2 Tbsp olive oil in large saucepan and warm over medium heat. Add mushrooms and zucchini and cook for 8-10 minutes, stirring occasionally. Add chopped garlic, sun-dried tomatoes and remaining 1/2 tsp ground black pepper and cook for another 5. minutes. Add chopped basil and stir. Remove saucepan from heat. 5. Remove chicken from oven and pour saucepan contents over chicken. Enjoy! This autumn-y oatmeal has been my go-to this month for a quick breakfast before running out the door. I use instant oatmeal (although I am sure it would be tasty using overnight oats, as well) and pumpkin butter for this quick morning meal. Also, just a fun fact: pumpkin butter is not actually butter at all – it is pureed pumpkin, oftentimes mixed with honey and some lemon juice and typically has less than 35 calories per 1 Tbsp serving. That is a lot of flavor for minimal calories! Plus, pumpkin supplies beta carotene, which your body can convert to vitamin A. This pumpkin-y bowl full of cinnamon spice and heart-healthy walnuts is a seasonal way to start your day off right with fiber, omega-3 fatty acids and a tasty spoonful of beta carotene-rich pumpkin! *Note: If you are interested in a heartier breakfast and looking for a way to increase calcium intake, you can prepare the oatmeal with milk in place of water! 1. Cook oatmeal according to directions on package. 2. Add pumpkin butter and cinnamon and stir into oatmeal. 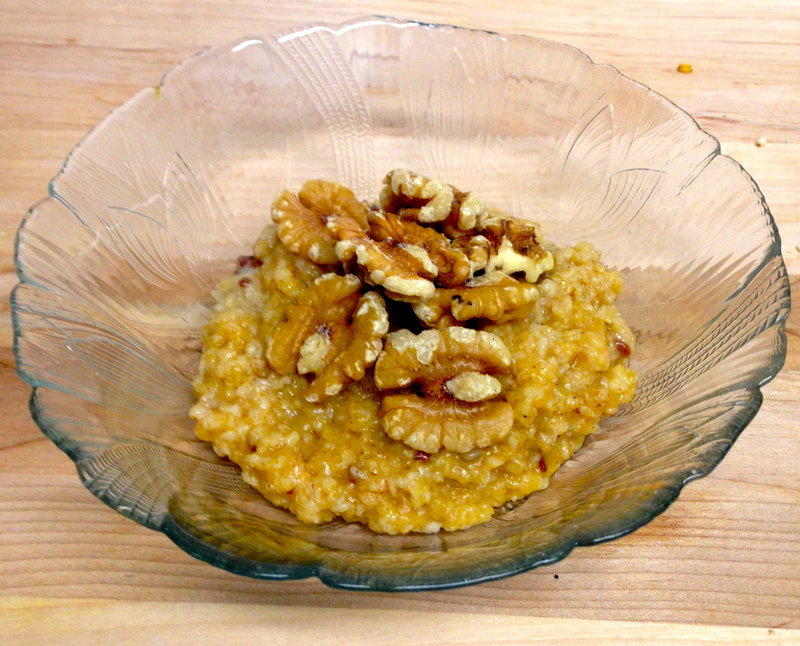 Top with walnuts and enjoy! This dish offers protein, fiber and a ton of vitamins and minerals for minimal calories (and minimal prep time)! Tomatoes offer lycopene, beta carotene and vitamin C, while green beans are a rich source of vitamins K, C, folate and manganese. 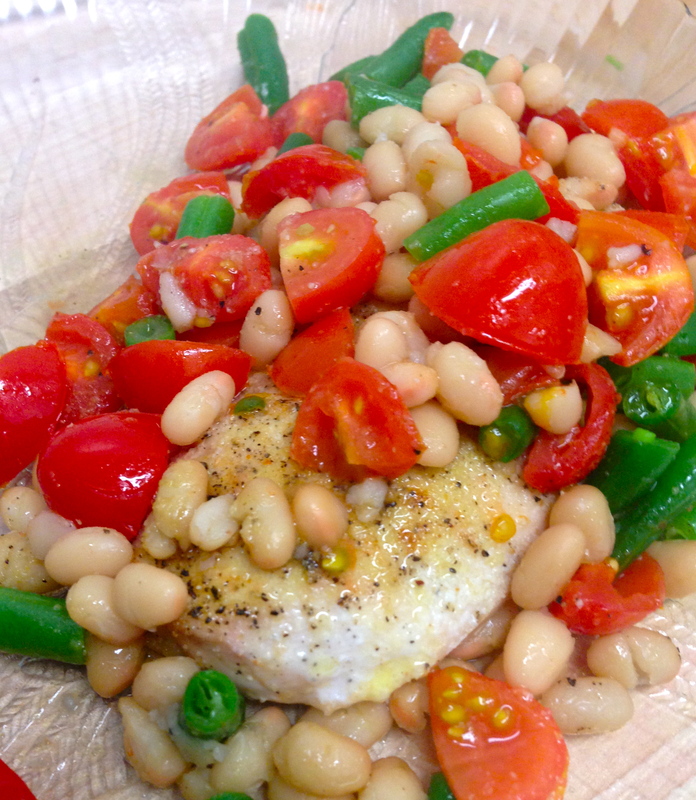 Navy beans add even more protein to this chicken dish, as well as heart-healthy fiber, to keep you feeling full. I like to make this dish at the beginning of the week so I have healthy, easy leftovers for the beginning of the busy week. 2. Spray 9 x 13 inch casserole dish with nonstick vegetable oil cooking spray. Place chicken in casserole dish. 3. Evenly distribute the salt, cayenne pepper, 1 tsp garlic powder, 1 tsp onion powder and 1/2 tsp ground black pepper among each chicken breast. Drizzle 2 Tbsp olive oil over chicken breast and place in oven. Bake until chicken is cooked through – approximately 25-30 minutes. the chicken should reach an internal temperature of 165 degrees Fahrenheit. 4. Steam green beans until brightly colored and soft but still tender. *This can be done either by using a steamer or by placing cut green beans in a microwave-safe bowl covered in parchment paper for approximately 1 minute and 30 seconds. 5. Remove chicken from oven. Add navy beans, tomatoes and green beans to casserole dish and distribute so toppings gather around the sides of the casserole dish. Add remaining 1/4 tsp ground black pepper, 1/2 tsp garlic powder and 1/2 tsp onion powder. Drizzle remaining 1 Tbsp olive oil over dish and place casserole dish in oven. Bake for an additional 10 minutes. Enjoy! 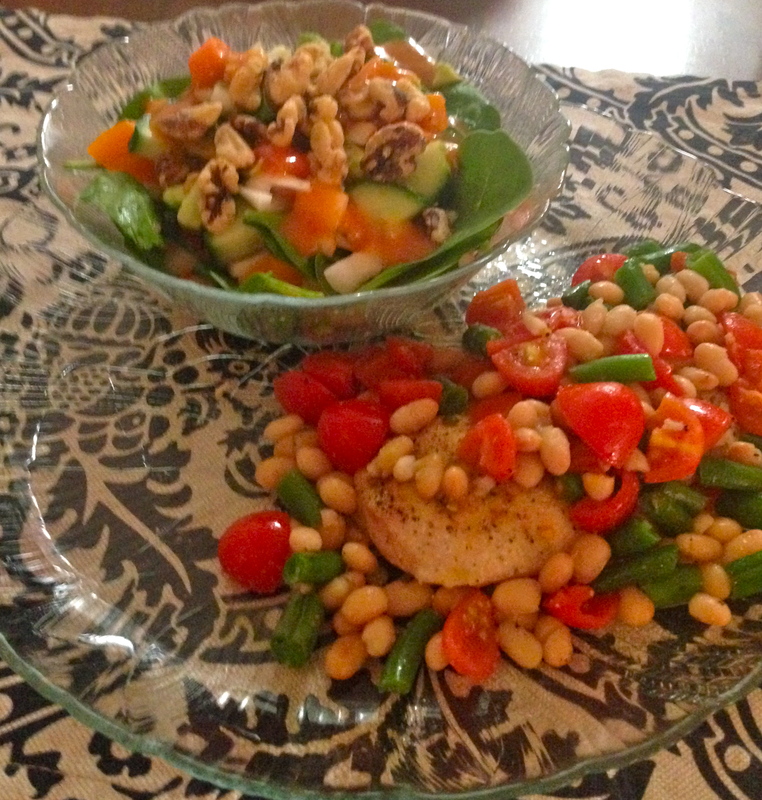 I served mine with a side salad of spinach, bell pepper, tomato, cucumber, avocado and a handful of walnuts! Craving take-out? I promise, this is better! This simple dish is a great way to fuel up with protein, healthy omega-3 fatty acids, vitamins and minerals without overdoing the carbs and calories. Load up on vitamins A, C, K and folate with this dish, as well as potassium and zinc. 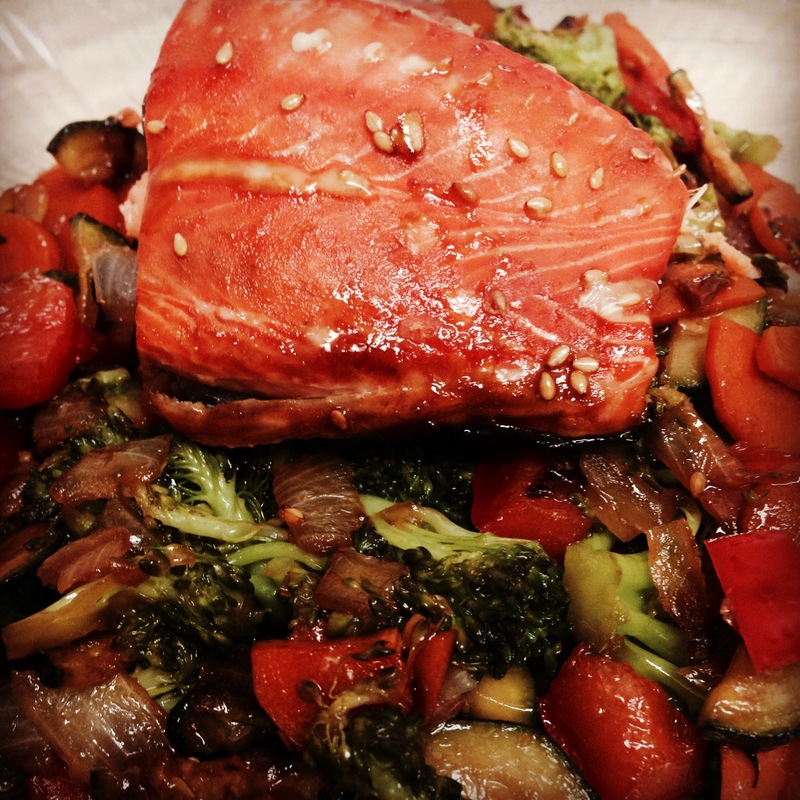 Also, salmon contains high levels of omega-3 fatty acids. The American Heart Association recommends consuming at least two (3.5 oz) servings of omega-3 fatty acids per week, since omega-3 fatty acids may decrease inflammation within the body, which could lower your risk for developing heart disease. This dish supplies almost an entire week’s worth of these anti-inflammatory fatty acids. And the best part is it only takes about a half hour to prepare! 2. Spray casserole dish (or cookie sheet, or whichever you prefer to use for the salmon) with nonstick vegetable oil cooking spray. 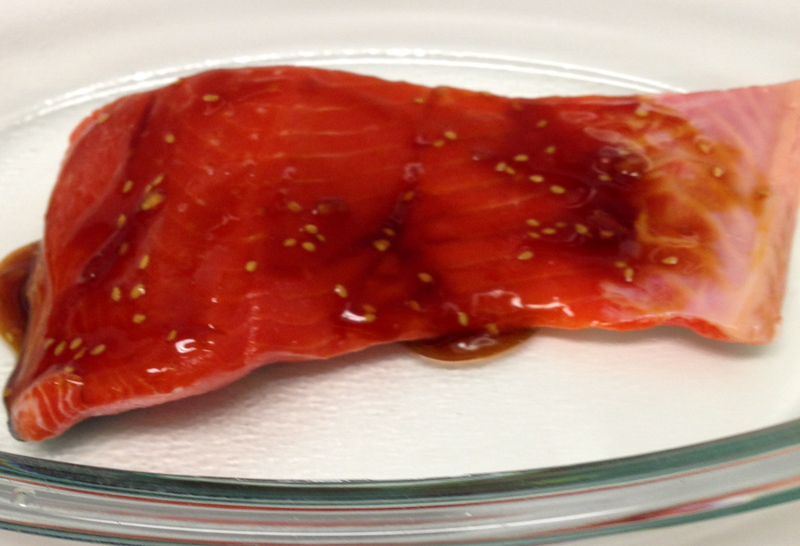 Place salmon in dish and spread 1.5 Tbsp Teriyaki marinade over fish. 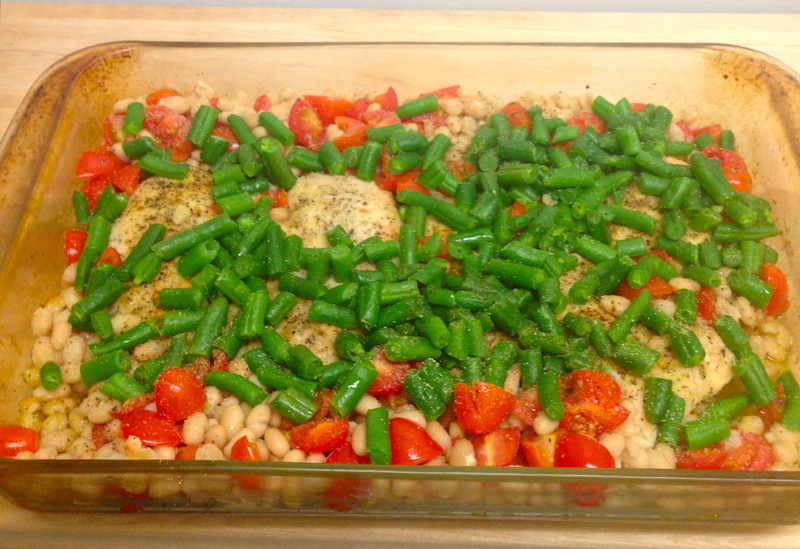 Place in oven and bake until cooked through (approximately 25 minutes). 3. Heat olive oil in medium sized skillet over medium heat. Add onions and cook 2-3 minutes. 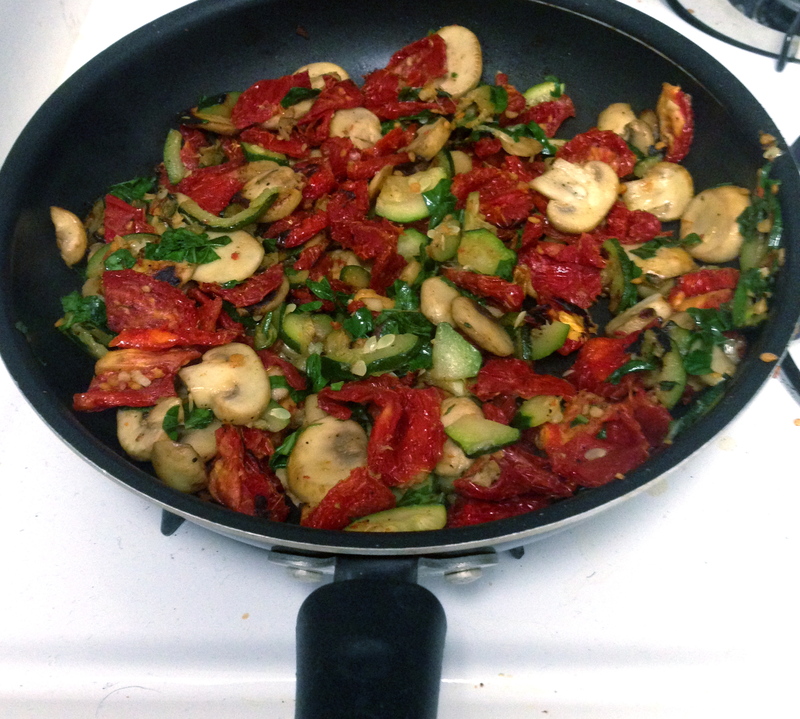 Add bell pepper, mushrooms and zucchini and cook another 10 minutes. 4. Place chopped broccoli and sliced carrots in microwave-safe bowl and cover with wax paper. Place in microwave (on high) for 1-2 minutes, until vegetables are bright in color and softened (but not soft). 5. 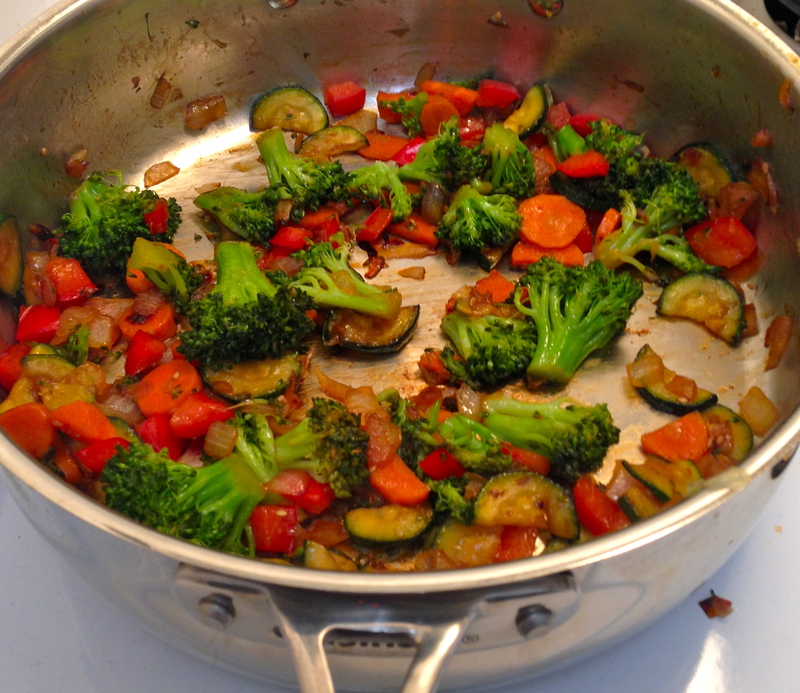 Add broccoli and carrots to skillet. Add remaining 1.5 Tbsp Teriyaki marinade and stir. Cook for another 2-3 minutes. 6. Transfer vegetables from skillet on to a plate. Top with baked salmon and enjoy! Now just combine with salmon and serve!